Here we are with the grad kid. 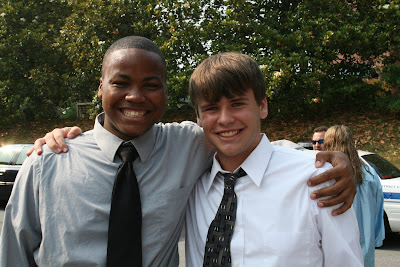 My son and his buddy who graduates next year but played in the band this year. The graduation wasn't a bit impressive, but we were sure proud of the kid. 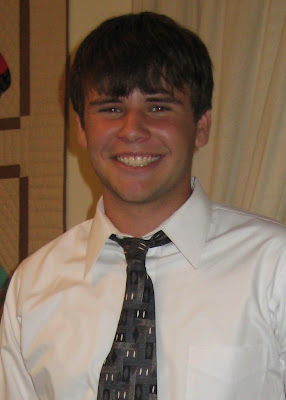 He cleans up nice and definately looked like a young man (even if he'll always be my baby). We snapped a few pictures in the parking lot and then headed back to the house to hang out and get ready for the barbecue luau scheduled for the next day. I'd been sleeping at the hospital all week with my Mom who got sent there when she went to the doctor on Tuesday. She was bummed about being in the hospital and also about missing graduation. The guys pitched in and did a lot of house cleaning, yard work and picked up the food for the barbecue. I'd made little lists at the hospital, and the fellows made the store runs. All the relatives from out of town made it in. They were stacked about knee deep (-: We did have three houses local to spread everyone out but still ran short on beds. And, no, there are no motels in town. Plus, that would cut way down on the fun. Needless to say, graduation weekend turned out to be a bit hectic. What a handsome dude! What are his plans after graduation? Congrats to him and TO YOU ALL for a job well done. Thank you. I'm awfully proud of him. 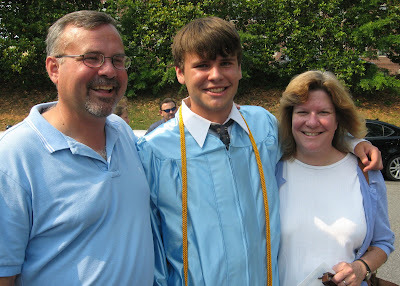 The kid-o heads to UNC Chapel Hill in August. He wants to be an eye doc. Whew. I'm going to miss him.